The medical term for ear wax is Cerumen. The ear wax is normally a thick, yellow and wax-like substance that is found in the ear canals of human beings. The purpose of the formation of ear wax is to provide safety to the ear canal from being infected by bacteria and fungi. The ear wax also act as deterrent against entry of other small micro-organisms as well as water into the ear canal. The wax also acts as a natural lubricant for the canal. It prevents the dust and dirt particles from reaching and infecting the ear drum. Under normal circumstances the ear wax is automatically removed from the body along with dirt particles. However, if the ear wax gets accumulated in the ear canal, it can lead to blockages. The ear wax gets pushed deep into the ear canal by use of objects like ear buds, pens, tissue corners etc, in the ears. Use of ear plugs and hearing aids are also responsible for the blockages. During a blockage caused by ear wax people find it difficult to hear clearly. They also have a sense of ringing in the ears accompanied with pain and feelings of dizziness. It is therefore important to clean your ears once every 15 days. 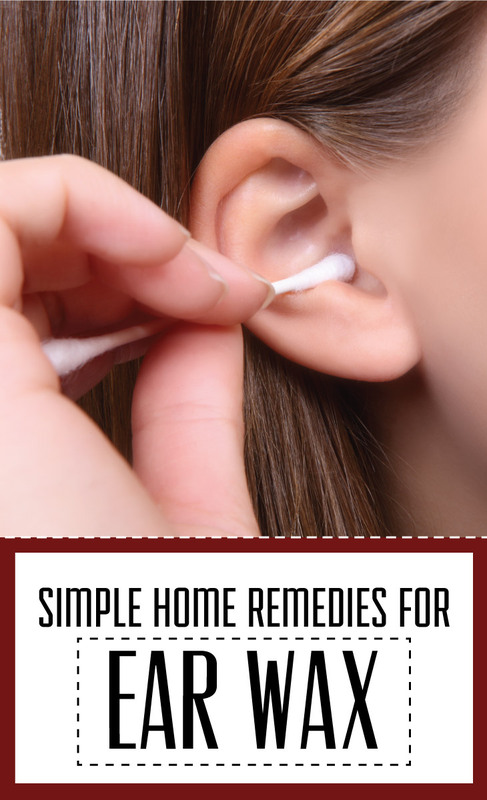 You can go to a doctor and get the ear wax removed or you can do it at home easily. Put 3-4 drops of hydrogen peroxide in the ear and tilt your head to the other side. Stay in this position for 2-3 minutes and then tilt your head to the side of the ear to drain out the ear wax along with hydrogen peroxide. Now very gently put a stream of warm water in your ears using a syringe. Do not apply pressure while putting water in the ears or you may damage your ear drums permanently. After a minute tilt your head to drain and clean the ear off hydrogen peroxide. Dry your ear using a clean cloth. Sometimes the ear wax hardens and it becomes difficult to remove it. When this happens, pour 4 drops of baby oil into the affected ear and tilt your head to the other side. Let the baby oil work it’s magic in your ear for 2-3 minutes and then drain out the oil. Use a soft q-tip or ear bud to remove the softened wax from your ears. Olive oil is another great remedy for removing the wax pile up in the ears. Warm a tablespoon of olive oil and pour 4 drops of warm oil in the ear. Leave for a couple of hours and then remove the wax using ear buds. You can also put warm water in the ears using a syringe and then tilt your head after a couple of minutes. The wax will drain out along with the mixture of water and oil. Use any mineral oil or mustard oil in case you don’t have olive oil handy. Remember to warm the oil before use since warm oil tends to travel faster into the ear canal and melts the hardened wax better.